The DJI OSMO is not a perfect system, but certainly a quality device with outstanding image quality combined with a super smooth gimbal stabilizer. Battery life isn't great, and audio is pretty much non-existent without the aid of an external microphone. Another thing that really bugged me is that although they claimed the X3 camera on the DJI OSMO was similar to the X3 on the Inspire1 Quadcopter, the software (DJI GO) was not the same and lacked many of the color profiles and even lacked D-LOG which I use when I fly. No worries because today they've updated the DJI GO APP and now you have 10 new color profiles - including D-LOG to achieve even better quality. Youtube member Ian W Arsenault put together this short video to show off these new profiles. So to be clear you don't need to download any firmware, and you don't need to do an update to the OSMO hardware. All you need to do is update the DJI Go App (ios app store), and that will open up these new options and color profiles on your DJI OSMO. Tip: If you're planning on picking up an OSMO I highly recommend getting at least one spare battery, and the ND Filter kit. The ND Filters will give you better control over your shutter speed to make the motion blur look more natural. Posted in dslr video. Tags: dji osmo 4k, dji osmo d-log, dji osmo gimbal camera, dji osmo sample on November 18, 2015 by Emm. Ok, are any of the other handheld encoded gimbal products due to be released in the next 4-6 months worth waiting for? There was one on Indiegogo due in March... Or will they all work basically as well as one another? @Mike - I think the GoPro is easier and much more versatile than the X3 camera. You get nice clean audio without having to use plug in mics. You get a screen (without using a wifi app), and longer run times. It's smaller too. I would go with a GoPro. Emm, deciding between the GoPro Silver + Came Action & the standard Osmo (with the X3). I'm looking for a video device to use mainly with family; I have a one month old. I could probably find these answers somewhere else on the internet, but I do not have the time. Do you think one stabilizes noticeably better? How does the image quality compares? Is one of these setups much smaller than the other? Do you find one setup easier to use? Any comments would be much appreciated! @Robert - Pros and Cons between GoPro HERO4 and OSMO + X3. 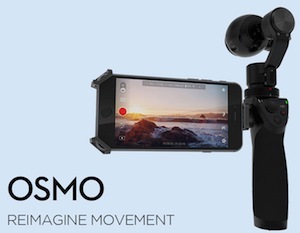 For 4K video outdoors many would like the OSMO because it doesn’t have that wide angle look. But that could be a con too, because i’m often wishing I had a wider view from the OSMO (like when shooting indoors). But when shooting people the OSMO is more flattering as it’s not distorted. Both cameras perform best with lots of available light. I'm thinking to buy a small camera. How is the video quality of the X3 compared to Gopro Hero4 black? Is the X3 good enough to be used for events, like weddings and music videos? For gimbal footage and B-roll? I have a Canon 5D Mark III as primary camera. Emm, how is the sharpness on this? Is it strong like the one for the Inspire 1? Also what is your sharpness setting on the Inspire 1? -1, -2 or -3? Thanks in advance!